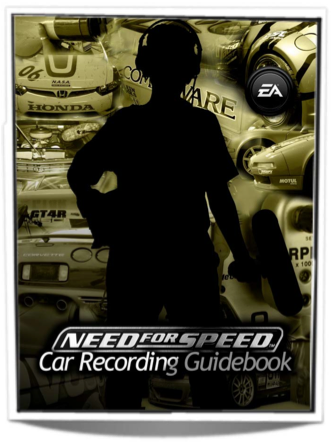 The following article contains small excerpts of the 65 page “Need for Speed” Car Recording Guidebook, published internally at Electronic Arts, written by Charles Deenen. Car sounds are some of the most inspiring and entertaining sounds to record. 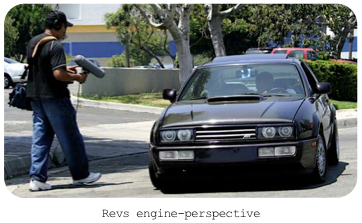 Like a human voice, each car has a signature sound, with the driver being the actor. Recording these machines should be simple right? You call a buddy with a cool car, grab a microphone and recorder, go find a spot somewhere and hit record. Many folks have had great luck doing it this way, but when deadlines, ownership and budgets are at stake, you can’t risk shooting from the hip. The following pages are a random sampling of some the book and mainly cover the setup phase. Thanks to the many folks who originally contributed their thoughts, pictures and feedback to the full book. 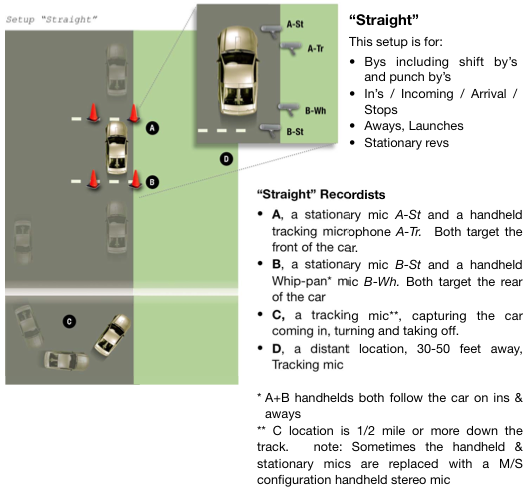 The recording setup procedure is mostly for gaming, but will help any person setting up car (or any vehicle) recordings. 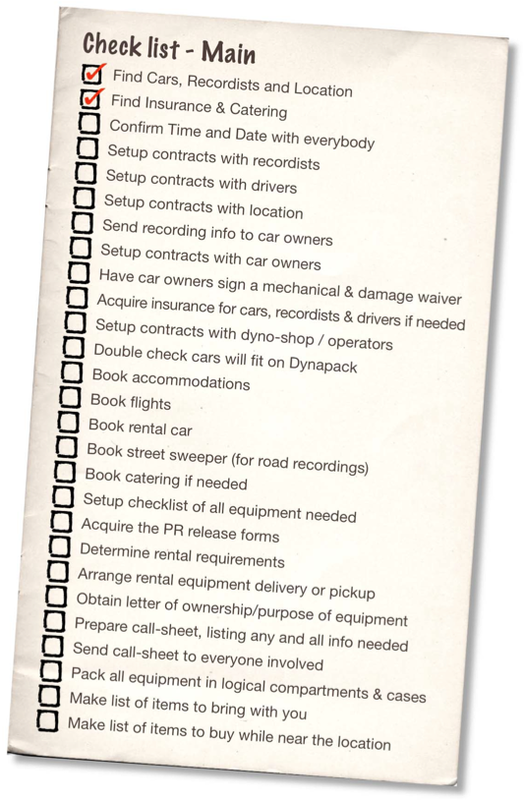 The following is a list of steps to ensure a successful recording session. 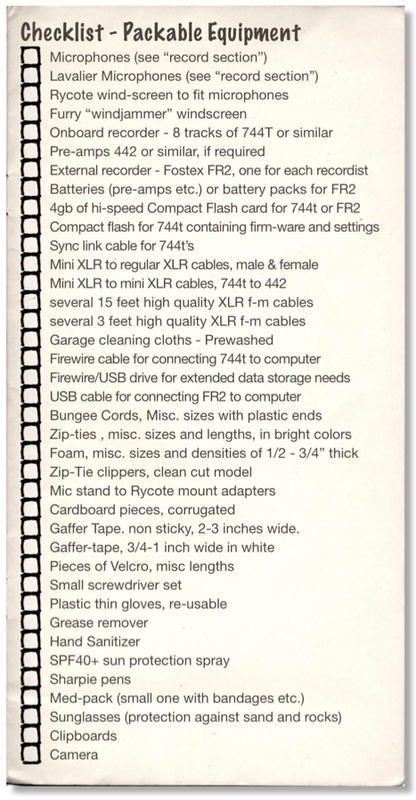 We’ve sometimes skipped items on this list, but in many cases wish we hadn’t! Safety. Your budget might not enable you to record on a track, or allow for proper insurance. Time and Detail. The time you might have with the car might be severely restricted, thereby not allowing you the time required to address details like wind-problems. Ability to obtain “hard to get” cars. Before booking the car, make sure you like the “Tone” and character of the car, especially if the fee involved is high. 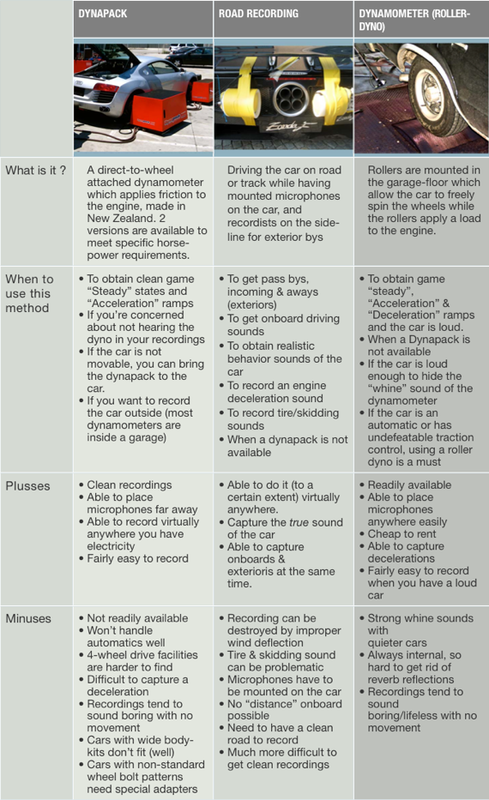 Hire a local recordist to test-record the car. Make sure they use the recorder and microphones you have specified and know. Since this recordist is the first interaction with your car owner and your company, make sure he/she behaves very professional. Hiring a local recordist blindly is therefor not preferred. Instruct the test recordist to not get into conversations about money, safety, insurance or anything else not sound related. Make sure he politely thanks the driver/owner, and that they have your contact-number. All specs, upgrades, modifications of the car verbally spoken. Include name of driver, phone # etc. Revs from both the engine and rear of the cars. 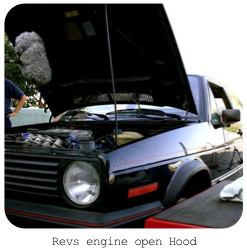 For the engine side, get both regular perspective (see picture) and one with the hood open, mic’ng it close-up. Car by with a shift-up past the recordist. problems and driver/owner. Politely ask the owner/driver about the found problems, and if they are fixable. 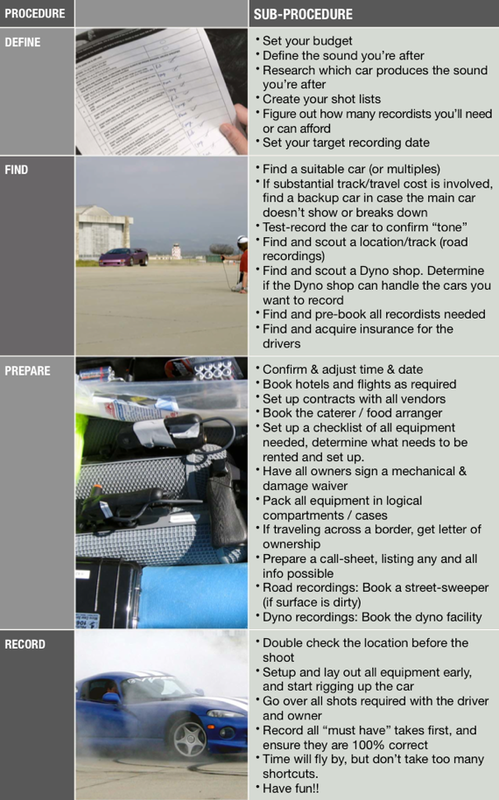 Obtaining Contacts; You can call the car-teams to find out about contacts for tracks and airports. If not, googling is your best bet. You often will have to do quite a bit of diggin’ before you find the right person. Inspection; If you can’t visit the location before recording, hire somebody in the area to take pictures, inspect the environment and surface. If possible, have this person also do a “noise-test” recording. Rev up a car 50 feet away and check if the environment’s noise-level is acceptable. Dirt/Rocks; if you like the location, but there’s loose material like Dirt/Rocks, it can be removed by a street-sweeper. Find out if there’s one available for rent around the location. The deal; When dealing with the owner/representative of the location, they hear “money” the moment you say “video-game” or “Movie”. Try to establish the price before you mention it. The opposite is true as well. Sometimes these folks will actually cut you a deal when they hear it’s for their favorite game. Feel it out carefully. Other users; Some locations are shared with others (like race-tracks). Before committing, ensure that the location is quiet enough, or the possibility for enough sound isolation exists. Forest roads; If there’s no wind and birds, closed forest roads are amazing. They act as a large enclosed “tunnel”, and the sound will travel very far. Walled Areas; Sometimes you need an enclosed sounding area for a particular “sound”. Make sure the road is closed off to other traffic in case you’re going going to break any speed laws. Privately owned roads are the easiest to obtain. Time of Day / Time of Year; Birds and crickets are the most active during early & late parts of the days in hot times of the year. Try to avoid “subtle” recordings like distant car-bys & ins during these periods. Recordists for cars are specialists in this area. You want to hire people who’ve done this dozens of times before. Saving money on lesser experienced people is not worth the hassle in the long run. Equipment; Operates and knows the equipment they’ll be using. Find out what the recordist will be bringing, and if you feel it is enough coverage. If not, negotiate the extra rental equipment and figure out who’ll be bringing it, and who’s paying for it. Time; be very straight-up with the recordist in regards to time they’ll have available to setup, mount mics on the car, calibration etc. They have to be comfortable with this time for the session to succeed. Technically savvy. The recordists needs to know the mechanical parts and workings of a car well. This will allow them to operate quickly and safely. Mounting microphones in extremely hot & dangerous areas would not be good. Reliable behavior. Shows up on time, does what he says. Works alone when needed. Pleasure to work with. You’ll be spending a lot of time with the recordist. Ensuring he’s a pleasure to work with, will make for some enjoyable productive days. Insurance; It should be very clear, and stated in a contract how the recordist is insured, whose responsible for the equipment he’s using etc. It usually falls on your shoulder to pay for any damages done to equipment. 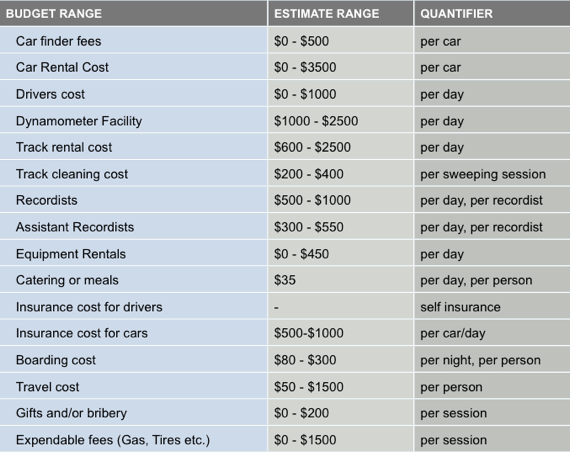 The deal; The deal should include milage-cost, day-rate (up to X hours), equipment (incl. rentals). It should also provide you the cancellation agreements. 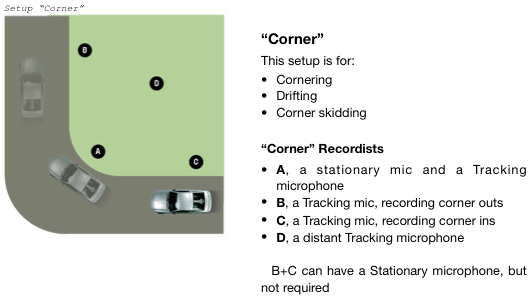 Hopefully these (short excerpt) pages were helpful for setting up your next vehicle recording. The full book can be read if you’re employed at Electronic Arts. In case of doubt, just hire John Fasal or Bryan Watkins, or any other qualified car recordist. They’ll get you the desired result. They’re their worth in gold sometimes. I’m still studying audio engineering, and I want to do that! Great post – a definite ‘bookmark’ for future reference. Thanks, this is extremely useful. Wow. I know that took some time to put together so thank you! I’ll refer back to this often. 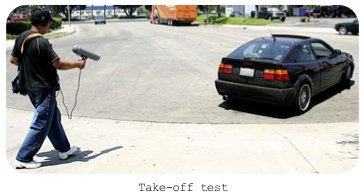 The next logical question…is there a guide for aircraft? Sorry, none for aircraft available from us, but I’m sure somebody out there can give you some great tips on recording air-crafts. Great article, Charles. Thanks for sharing it! Thanks for a very detailed site, including all the sidebar links! Much appreciated. Can you tell us a programm, with we can easy modify the recordings to flat and clean sound samples?